Currently MLG, which focuses solely on saddle stitching in print finishing, uses a Muller Martini Bravo that was manufactured in 2001. The new Primera with a cover feeder, six flat pile feeders and an Apollo compensating stacker is not only designed to cater to the company’s higher printing capacity. 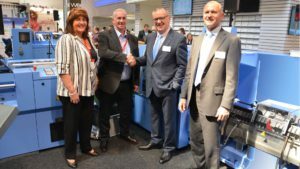 “We’re also anticipating a reduction in changeover times of at least 50 percent compared to the current model thanks to automatic setup,” says Janette McAllister at the Muller Martini booth at drupa in Düsseldorf. She and her husband Brian McAllister own and run the company, which employs 80 people and is based in Glasgow, Scotland’s largest city. In addition to a wide range of commercial work, MLG chiefly produces magazines and brochures in run sizes ranging from a few thousand to tens of thousands of copies. Its customers are not only publishing companies, but also printing plants, which contract MLG to perform print finishing. MLG in Glasgow, which decided on a Primera saddle stitcher at drupa, is run by Janette and Brian McAllister. Right: David McGinlay (SM at MM UK) and Dirk Deceuninck (RM at MM Northern Europe).